One goal of prevention measures is to remove any perception of crowding. You can do this by taking stuff out, or by putting space in. Construction of new com inhibits swarming, so early measures for us included giving them busy work (and ultimately more room to store honey). We gave them a top bar with a bit of old comb, properly centered, to work with. However, after buttoning up the hive, we looked in the window and they still looked crowded. The space we'd just made was immediately filled with bees. This is what they built in just 5 days. Isn't it beautiful? Unfortunately, the comb is not centered on the top bar despite the start we gave them. Here is comb #14. It used to be a fat honeycomb. The next swarm prevention measure we had planned was to make sure the bees were not honeybound by removing any old honey abutting the brood nest. We were a bit surprised to find the one we'd earmarked had been converted to brood. (Did we not move them forward enough? The brood nest is really expanding toward the back of the hive.) Anyway, we stuck to the plan and removed it. It had lots of drone cells, which gave us our first opportunity to drone cull. Marty Hardison is a strong proponent of drone culling, recommending that all drone pupae be removed up to 3 times a year. In the image below, you can see a varroa mite on a larva that was about to be capped, the foundress' preferred timing. By some statistics, 80% of varroa in a colony are under the caps. In other words, each mite you see roaming around represents 5 in the hive! The flat caps on the left are worker bees, and the bumpy caps on the right are drones. Varroa mites prefer drones because they take longer to develop. The mites have more time under the protection of the cap to reproduce. In a worker bee cell, 1 mite becomes 8 but in a drone cell 1 mite has the potential to become 27! It helps to have something pointy to scratch open the cap and remove the pupa. Don't try to pull out larvae; they disintegrate. There are 4 females and 1 male varroa (small white one on his left eye) on this pupa. By culling this drone alone, we've reduced the load on the colony by 108 varroa in the next brood cycle and 2,916 in the next! While it was difficult to kill so many developing bees, all but one of the dozen or so pupae we examined had a rider on it. This was a good comb to pull out of the hive. (We put in under the bird feeder but the birds weren't interested. The squirrels, however, loved it.) We doubt that we'll ever be as comfortable with the prcedure as Marty, but we now fully realize the prevention value of drone culling and won't be so squeemish about when it's time to do it again. I been reading about drone culling after seeing a varroa mite on a bee in my hive and I'm not sure if I can do it yet! You might be changing my mind after reading this post, great photos! Planning on getting a VSH queen with my next package of bees when we get out to Colorado, hopefully I can find some at this late date. I don't think I could be without bees! Right back atcha! Bees and Chicks is on my blogroll. Your "And One Hive Makes Two" post... OMG hilarious! I can only hope I'm still able to laugh if our girls swarm. Hi I'm from Airedale Beekeepers in West Yorkshire, England. Love your photos. 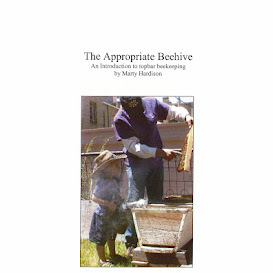 May we use some for our beginners beekeeping handbook please? Thank you for inquiring, @Chris Hardy. For handbooks being distributed free-of-charge, absolutely you may use images from my site, with proper attribution. Please send me a PDF when you are done writing it. I would love to see how it turns out.